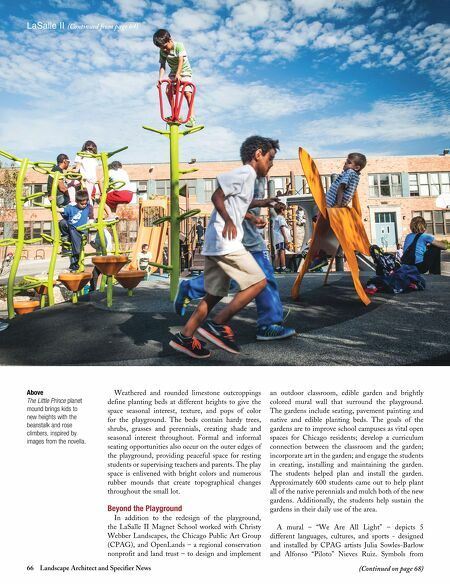 66 Landscape Architect and Specifier News (Continued on page 68) LaSalle II (Continued from page 64) Weathered and rounded limestone outcroppings define planting beds at different heights to give the space seasonal interest, texture, and pops of color for the playground. The beds contain hardy trees, shrubs, grasses and perennials, creating shade and seasonal interest throughout. Formal and informal seating opportunities also occur on the outer edges of the playground, providing peaceful space for resting students or supervising teachers and parents. The play space is enlivened with bright colors and numerous rubber mounds that create topographical changes throughout the small lot. Beyond the Playground In addition to the redesign of the playground, the LaSalle II Magnet School worked with Christy Webber Landscapes, the Chicago Public Art Group (CPAG), and OpenLands – a regional conservation nonprofit and land trust – to design and implement an outdoor classroom, edible garden and brightly colored mural wall that surround the playground. The gardens include seating, pavement painting and native and edible planting beds. The goals of the gardens are to improve school campuses as vital open spaces for Chicago residents; develop a curriculum connection between the classroom and the garden; incorporate art in the garden; and engage the students in creating, installing and maintaining the garden. The students helped plan and install the garden. Approximately 600 students came out to help plant all of the native perennials and mulch both of the new gardens. 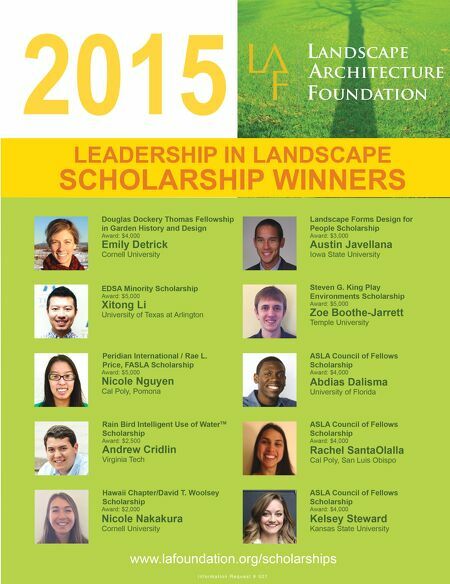 Additionally, the students help sustain the gardens in their daily use of the area. A mural – "We Are All Light" – depicts 5 different languages, cultures, and sports - designed and installed by CPAG artists Julia Sowles-Barlow and Alfonso "Piloto" Nieves Ruiz. Symbols from Above The Little Prince planet mound brings kids to new heights with the beanstalk and rose climbers, inspired by images from the novella.